Eintracht Frankfurt’s players danced in pure elation after securing their Bundesliga status thanks to a 2-1 aggregate victory over 1. FC Nürnberg on Monday night. The Eagles, who went into the play-off after three wins in their last four matches of the regular season, sealed a deserved 1-0 win at the Grundig Stadion to remain in the Bundesliga for a fifth consecutive year. For Nürnberg, however, the immense disappointment of missing out on a return to the top flight since their relegation in 2014 was palpable. bundesliga.com rounds up the best of the post-match reaction from the two camps. 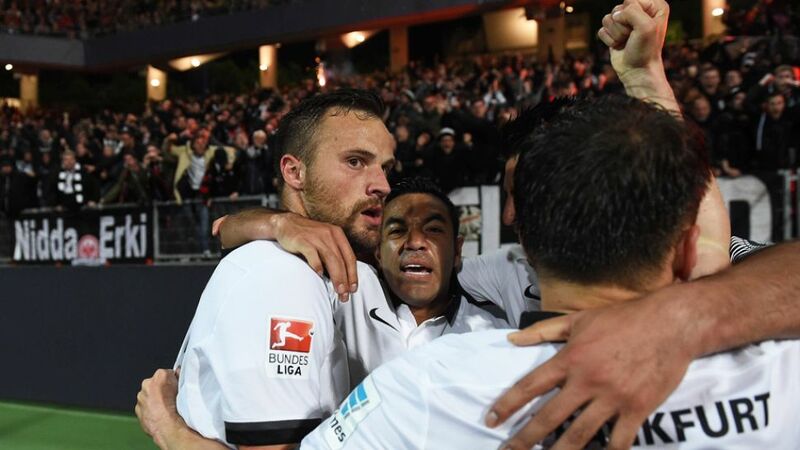 Haris Seferovic (Frankfurt striker and matchwinner): "There is a god! I think the better team won the game. It wasn’t easy but we managed to get the goal and hang on. We’re staying up and that’s great. I’ve scored a lot of goals in my career and perhaps it was one of the most important. The coach just told me to keep going, that I’d score, and thankfully it worked out. It’s a huge relief for the fans, the club and the city." Alexander Meier (Frankfurt striker): "I’m just happy that it’s over! But we’ll definitely celebrate somewhere." Niko Kovac (Frankfurt coach): "Thank God we’re still in the Bundesliga, but at the end of the day we deserved it. I’m happy that we’ve managed to stay up, but I feel for Nürnberg. However, I think it would have been a travesty if we’d not won. We’ve banished the memories of the whole season with that goal." "So proud of you guys!" Georg Margreitter (Nürnberg defender): "I can't find the words to speak. We didn't give much away and we fought until the end. The fans were amazing - I've never experienced anything like that before. It's unbelievably painful that we've not been able to pay them back with promotion." Guido Burgstaller (Nürnberg striker): "It's a massive disappointment. We played better here than in Frankfurt. The atmosphere was brilliant, just crazy, and we can only say thanks for that. It was also down to the supporters that we've been so successful this season. I'm just really gutted to have had such a good season and then to lose in the play-off." Miso Brecko (Nürnberg defender): "In terms of their football, Frankfurt were better, but we played a with a lot of heart. We had some good opportunities today that we didn't make the most of." Rene Weiler (Nürnberg coach): "I want to congratulate Eintracht. Everybody saw that they were better than us in this game. We could hardly create anything. The emotion right now is still one of disappointment, but if we take a step back and consider what we've done, we've had a great season. We'll just have to have another crack at it next season. We don't need to talk too much about the two matches. We were simply second best." "A picture says more than a thousand words."